In 1915 the Australian and New Zealand Army Corps(AN ZACs) landed at Gallipoli in Turkey following an ill prepared military strategy that resulted in futile slaughter on both sides. The great victory was that their withdrawal was bloodless on both sides. The planning for the withdrawal by comparison to the battle plans was carried out with such efficiency that the high command had a consolation prize with which to save face. Many 'diggers', as the ANZACs were called, were saddened to leave their fallen comrades behind seemingly having sacrificed their lives for nothing. 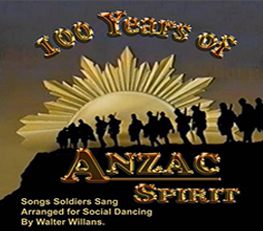 With the above in mind, Loreen DiSipio and John Batterham choreographed an Australian New Vogue foxtrot, called the ANZAC Centenary Foxtrot, to commemorate the 100th anniversary of the Gallipoli landings so that the memory of all those who sacrificed their youth and often their lives in the interests of their respective countries, will live on.